Folx is a free download manager for Mac OS X with a true Mac-style interface. It offers convenient downloads managing, flexible settings, etc. Folx for Mac has a unique system of sorting and keeping the downloaded content. Folx has a modern interface with Retina displays support. It offers unique system of sorting and storing the downloaded content with a preview of the downloaded files. Folx by Eltima is a powerful torrent client. The app downloads torrent files as well as creates new torrents for various trackers. With Folx downloading torrent files is intuitive and simple. Tagging feature makes search through downloaded content quicker and easier. Folx allows you to prioritize your download tasks and control download and upload speeds according to your needs. Apart from downloading files from torrent trackers Folx enables you to download using magnet links. The latter means you do not have to save a separate file before starting the actual download, which is convenient. It also allows you not to advertise the fact that you are using P2P technology. Any download can be assigned with a tag or multiple tags in Folx. This way Folx will sort the downloads in Tags panel. By clicking any tag you will be shown other files marked with the same tag. Thanks to tagging you'll be able to find any of downloaded files on your Mac easily. Folx can split the downloads in 2 threads for faster downloading; can automatically resume interrupted downloads; offers multiple ways of adding download tasks. If you come across something you want to download on the web, Folx can automatically catch the downloads or it can catch only the specific types of files for downloading. Folx also features a browser extension, which has the options to download all, download selected, and download with Folx. The supported browsers are: Safari, Firefox, Opera, Chrome. 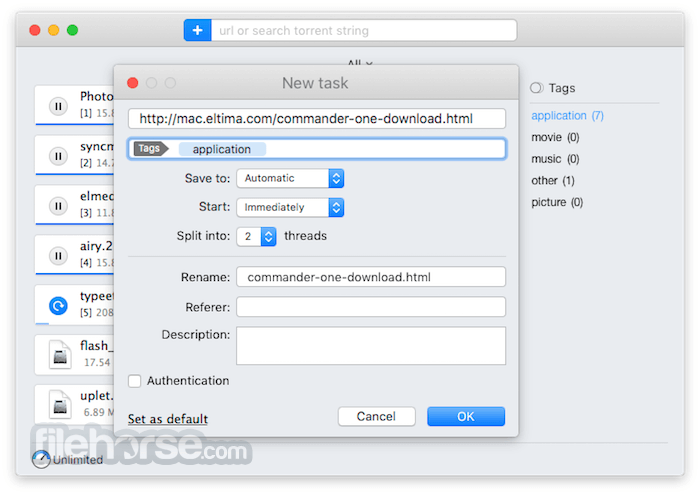 PRO version of Folx enables torrents search directly from the application. With Folx PRO you don't need to browse through multiple torrent trackers to find what you need. Enter a keyword in Folx, and it will search for it in its extensive list of torrent trackers and display a list of relevant results. Note: Limited functionality in the unregistered version. Requires 64-bit processor.